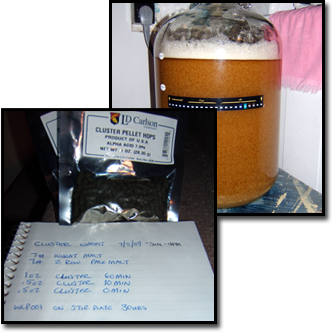 Today I brewed what I’m calling the Cluster Wheat, and no it wasn’t a Cluster-F! So today was the first brew day in a little bit, but it is also the first in what I think is four planned back-to-back (to-back-to-back) Sunday brew days, so I’m pretty stoked. Anyway, today was a pretty simple recipe that I brewed mostly for Karen and our friends Jody & Heather, though I will enjoy a few myself I am sure. So this is an American Wheat Ale brewed with 50/50 wheat malt and two-row barley and all Cluster hops, thus the name, though I was ready for everything to back-fire with a name like that. When the brew day started, I got my first hint that there might be trouble. I use a manual powered grain mill that I have a designated drill that I use for the power, sure beats a crank. Anyway, about half way through grinding the grains the drill gave up, no more milling. This is actually the second drill I have killed with the grain mill, I guess it is time to invest in something with some more torque, ya think? So the last seven pounds of grain were turned manually with a pair of vice-grips, I was ready for the worst after that. In all honesty things never got too bad, though they didn’t stay on course either. I missed my OG by quite a few points, horrible efficiency today (maybe because of the manual milling? ), I waited over an hour for the wort to cool and still couldn’t get it below 80’F, and had a lot of “extra” work today while brewing, so not as relaxing as I prefer. Honestly, I am not really sure what happened with the gravity. I had worked the numbers and planned on brewing a higher gravity four gallon batch and diluting it with really cold water to help lower the temperature and then achieve my assumed OG. Instead the un-diluted OG was what I expected my diluted OG to be, not good. Two scenarios: I either have a lighter beer than originally anticipated – OK, or, as I had already been thinking, I add some honey to the secondary to raise the gravity and to help lend another flavor aspect – could be cool. And I kind of already mentioned it, but to help fight the summer ground water temperatures I was going to dilute my wort with really cold bottled water. Temperature-wise this worked pretty well, I was able to drop the wort from 80’F to 70’F with one gallon of water, I can live with that. I also had four carboys to clean and sanitize, two kegs to clean and sanitize, and two beers to rack to kegs. That stuff makes the brew day go faster, but it really takes away from the relaxation part, but I do like both styles of brew days, so it’s cool. Next up is a twenty gallon batch with my buddy Garrett over at his place this Sunday with a recipe he came up with for a high end Pale Ale or low end IPA, but regardless it is going to be hoppy-yum-yums and that’s all that counts! Actually very much looking forward to next Sunday. After that is the Roby’s Red Rye (R3), which is a very heavy-handed rye beer with a decent hop addition and possibly spiced with caraway seeds. Then I have two “kitchen sink” beers to help clean up old inventory. One is an “amber beer” and the other is a “dark beer”. The amber should be pretty straight forward, but the dark should be like a stout with out roasted barley, if that makes sense. Oh, I kegged the Oatmeal Cookie Stout today. Not a bad stout (uncarbonated and warm) but the oatmeal cookie profile seems to have really faded to vanished. I am inspired to try again but I think this attempt may be a little flat. I was tempted to “spice” the secondary, but I really didn’t want a spiced oatmeal stout, I wanted a freaking Oatmeal Cookie Beer! This entry was posted on Sunday, July 5th, 2009 at 9:57 pm	and is filed under Homebrew. You can follow any responses to this entry through the RSS 2.0 feed. You can leave a response, or trackback from your own site.